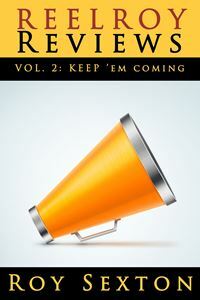 I’m not a fan of extraneous sequels to sweetly self-contained high-concept comedies. I loathe cash-grab second or third chapters to the kind of original, fresh, humanistic sleeper hits which dumbfound Hollywood execs who believe the only way to climb the corporate ladder is by churning out one superhero opus after another. Often, the follow-up overemphasizes any buzzy kitsch that defined the first film and buries any shaggy underdog appeal in a mountain of glib slapstick and opportunistic product placement. To me, Pitch Perfect 2 was, ahem, a perfect example of this commercial phenomenon, taking Rebel Wilson’s free-spirited second-banana “Fat Amy” and turning her into the unfunny, overexposed Mater (see Pixar’s Cars 2 … no don’t) of a cappella singing franchises. Poor Anna Kendrick (Into the Woods, Mike and Dave Need Wedding Dates), normally a luminous scene-stealer in any film, didn’t stand a chance. I’m happy to report that Pitch Perfect 3, while still utterly unnecessary, is a fabulous course correction to the enterprise, featuring the sweet harmonies and girl-power shenanigans of the now graduated-from-college “Barden Bellas” in all their goofy show choir glory. Directed by series-newcomer Trish Sie and written by Kay Cannon and Mike White, the threequel takes us on a European road trip as the Bellas, generally dissatisfied with the let-down of workaday adult life, stage one last hurrah, joining a USO tour alongside a surly power-pop-punk quartet (led by delightfully arch mean girl Ruby Rose), a Li’l John-adjacent rap act, and a mullet-wearing bluegrass jug band. What could have been a cliched let-down (European road-trip … really?) ends up a zingy meringue (albeit still pretty cliched) in the capable hands of the film’s solid cast. The vocals, as ever, are impeccable and guilty fun, as the Bellas aca-remix one overplayed pop radio ditty after another. The ensemble is populated with pros (Anna Camp, Hairspray‘s Brittany Snow, True Grit/Edge of Seventeen‘s Hailee Steinfeld, Hana Mae Lee, Ester Dean, Chrissie Fit, Alexis Knapp) who know how to spin sitcom stereotypes into compelling and relatable human beings. Blessedly, Kendrick is again in the driver’s seat narratively. The film reorients the series-focus back to her Beca character, still exhibiting outsize talent in a mediocre world that doesn’t know what to do with a whip-smart woman who isn’t particularly interested in playing reindeer games. Yes, series regulars Elizabeth Banks and John Michael Higgins also return as caustic a cappella competition commentators who seem to have landed in the Pitch Perfect films on their way to a Christopher Guest satire (e.g. Best-in-Show, A Mighty Wind). When asked by Kendrick where they came from when the duo materializes from thin air on an Air Force tarmac, Banks deadpans, “A little town called persistence.” They are a total hoot, even if they do appear to be in an entirely different film from everyone else. There is a jarringly odd subplot involving Daddy’s Home 2‘s John Lithgow (must he be in every movie this holiday season?) as Fat Amy’s sleazy Eurotrash high-stakes criminal father, and it’s a testament to the film and to Lithgow and Wilson that their rapport works as well as it does. The subplot seems tonally out-of-place with the rest of the proceedings, but it does give rise to a truly killer aca-cover of Britney Spears’ “Toxic” by the Bellas. The number runs twice in the film, and it is so sharply executed that it could have appeared a third time and not overstayed its welcome. Pitch Perfect 3 is a holiday trifle but a welcome one as it marries genuine wit and heart with a celebration of friendship and song and female agency that is always needed onscreen. A fourth entry in the series seems inevitable, and I won’t complain (much). The easy, warm, and inclusive dynamic of this cast is one I will gladly leave on repeat. This line from the musical Hairspray has always haunted me. I’m not a huge fan of the show, though I’ve always admired Harvey Fierstein and Marc Shaiman’s moxie turning John Waters’ bruise black 1988 satirical film about the horrors and sadness of socio economic marginalization, body shaming, and racial segregation into a bright, frothy Broadway musical. Damn if Shaiman’s tunes aren’t catchy! But back to that line. Matriarch Edna – played on stage by Fierstein, and the original film by Divine and in the first musical film version by John Travolta – declares this brutal truth to her husband as their relentlessly optimistic daughter chooses to head forth and audition for an American Bandstand-style local teen dance show. The Turnblads are anything but the typical Eisenhower Era, squeaky clean, nuclear family. With their rough hewn edges, “life is a banquet but don’t take too much” joie de vivre, economic challenges and “less than Greek” figures, this loving and relatable model of the typical American family does not fit the stylized mold of the typical American family that typical American families like to see on television. And this crucial line is the heartbreaking thesis of the show … and one might argue for daily ﻿life in these United States for 99% of us. The timing of this particular NBC live holiday musical couldn’t be stranger or more appropriate. Fifteen years ago when the musical first hit with its early 1960s setting and focus on the ugly racist/sexist bile concealed under Dippity-do and crinolines, it seemed like a quaint reminder of another era, one which many of us knew we hadn’t actually escaped, but about which we blithely, mindlessly lived in denial anyway. 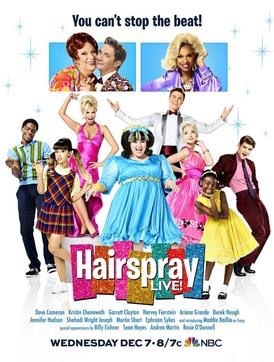 Now that we are making America great again, which may be code for going back to this oppressive, regimented, candy colored era, Hairspray Live felt like a haunting, sickening, Orwellian cautionary tale. Wisely, they stacked the deck with an army of pros in the adult roles, from Fierstein himself revisiting his Tony award-winning part in a winning mix of pea gravel, bombast, and the milk of human kindness to insanely annoying but sharply talented and utterly typecast Kristin Chenowith as race-baiting Cruella de Vil knock off Velma Von Tussle. SCTV vets Martin Short﻿ and Andrea Martin added some sweet-natured depth and color as Wilbur Turnblad and Mrs. Pingleton respectively but were often lost in the manic shuffle. Dancing With The Stars’ Derek Hough was the night’s most pleasant surprise, seizing the national spotlight the show provided to plant his flag firmly in Mt. Musical Theatre. His unquestionable technique paired with his slightly skeezy “toot sweets” charm was perfect for the role of Corny Collins, and he made the most of every moment, including what was either a wildly inappropriate or brilliantly meta embedded commercial for Oreo cookies. The “nicest kids in town” – including newcomer Maddie Baillio as Tracy, Ariana Grande as Penny, Dove Cameron as Amber, and Garrett Clayton as Link fared less successfully. It’s not that their performances were bad, but they were bland in the face of their scenery chewing elders. It felt like the cast could’ve used another week of rehearsals. However, that has been pretty much the case for every one of these live productions. So be it. Ephraim Sykes as Seaweed was the exception that proved the rule, however. He was a bolt of lightning across the screen, and I wished he’d had more to do. 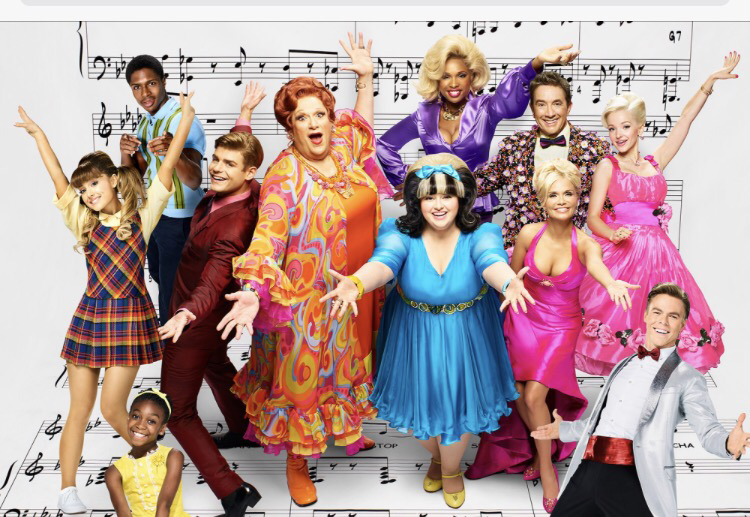 In short, this particular musical always just seems to exist chiefly as a delivery mechanism for buoyant, electrifying, raucous “anthem for the oddballs” finale “You Can’t Stop the Beat,” and Hairspray Live stuck the landing. I question how “family friendly” a musical that opens with a flasher on the streets and includes double and triple entendres in every other line might be. I chuckled when Sean Hayes and Kristin Chenoweth implored us to “gather the family” in the show’s opening moments. That said, the show’s message couldn’t be more timely or appropriate. For all American ﻿families. Great and small. It’s taken me a bit of time (for once) to digest all of my thoughts – less about the show and more about the absurd level of snotty, glib, social-media fueled schadenfreude it seemed to generate. Just when I thought this telecast (which I enjoyed by the way – more on that in a moment) would be another casualty of America’s silly “culture wars,” along came news that it was one of the most highly viewed shows in recent memory. The chief driver of controversy and ratings? Ms. Underwood herself, who somehow has become as big a cultural lightning rod as my beloved Miley. Really? Really, folks? Just unclench and enjoy that someone is trying something new – ironic, I know, given that this particular show is a pretty musty, overdone piece of musical theatre malarkey, but just go with me here. I applaud producers Craig Zadan and Neil Meron for attempting – and succeeding – at the herculean task of getting a three hour, live musical performed, mostly without a hitch, on prime time television to blockbuster viewership. Last time that happened? Fifty years ago with another Rodgers and Hammerstein musical – Cinderella – which I might also add committed the “sacrilege” of casting a “hot young thing” in place of another actress who had originated the role (albeit in an earlier TV version). Guess who? Yup, Julie Andrews was “replaced” by Lesley Ann Warren, who was not only a bit dodgy as an actress but not that remarkable a vocalist either. Zadan and Meron have pretty much led the charge over the past twenty years bringing the American musical into the broader popular consciousness of film and TV. And, yes, one of their gimmicks is creative and unconventional casting that gets them sponsorships, studio green lights, and viewership. Vanessa Williams and Jason Alexander and Chynna Phillips in Bye Bye Birdie. Kathy Bates in Annie. Brandy Norwood and Whitney Houston in Cinderella. Bette Midler and Cynthia Gibb in Gypsy. Richard Gere and Renee Zellwegger and John C. Reilly and Queen Latifah and Catherine Zeta-Jones in the Oscar-winning Chicago. And, yes, John Travolta (and Michelle Pfeiffer) in Hairspray. (NOTE: many of these folks were not necessarily considered musical stars before these productions, but are now.) Would these productions have been artistically “better” with Broadway vets in those roles? Probably. Would these films have gotten made, let alone watched and enjoyed by millions, without these stars? Nope. And, furthermore, Audrey Hepburn was cast over Andrews in My Fair Lady, the Hollywood penance for this decision in turn landing Andrews Mary Poppins and, I suspect, Sound of Music, which had been written for Broadway for Mary Martin (yes, JR Ewing’s mom who made a name among American viewers for playing a boy – Peter Pan). And should Barbra Streisand have played the lead in the film Hello Dolly! or Lucille Ball Mame? And don’t even get me started on Frank Sinatra and Marlon Brando in Guys and Dolls (the latter of whom is cuter in the role than people give credit). And I’m not sure I was that nuts about Beyonce in Dreamgirls, though I did adore another American Idol – Oscar-winning Jennifer Hudson – for her contributions to that film. What’s my point – other than showing off all the useless and opinionated knowledge I carry around in my noggin? I’m not quite sure, other than everyone chill the freak out! The producers wisely surrounded Underwood with a cast of pros (True Blood‘s Stephen Moyer’s rigid and kinda dull take on Captain Von Trapp notwithstanding). Audra McDonald as Mother Abbess and Laura Benanti as the Baroness were the absolute rock star standouts of the night. I hate “Climb Ev’ry Mountain” but I was in tears from McDonald’s rendition. And Benanti was a sparkling delight, humanizing what could have been a villainous turn. She has a perfect light yet intelligent touch for this kind of production – I hope they do more with her. The kids were all fine and avoided the cloying, insufferable trap into which so many productions can fall. Newcomer Michael Campayno was marvelous in the tricky role of turncoat boyfriend Rolf. The set design was sublime – beautifully detailed but consciously theatrical. And I got a visceral thrill when the cast would glide from one locale to another through an open door or a raised curtain, most notably when the family leaves their home for the climactic Nazi rally. My criticism of the evening? Those d*mn creepy Wal-Mart ads that seemed designed to appeal to some modern, overpopulated, Midwestern yuppie family that buys too much crap and communicates in dull, cutesy quips via their cellular devices when they are one. room. away. from each other. Argh! Why do people love this musical? And feel so fiercely protective of it? I’m not quite sure – there are much better shows out there, including Rodgers and Hammerstein’s many other offerings. There is a strange princess element – young nun finding love with a stodgy rich man in a castle. An inversion of the Beauty and the Beast tale? Or is it the nightmare panic that the Nazi element offers, including the pulse-pounding (and clever) escape from that oppressive regime while singing the oddly creepy “So Long, Farewell.” Not sure, but clearly a lot of folks love this darn story, so bully to NBC and the production team and the cast for their accomplishment and for giving the Wal-Mart generation a glimpse of another era. Let’s hope for more live theatre on network TV … and less Wal-Mart.